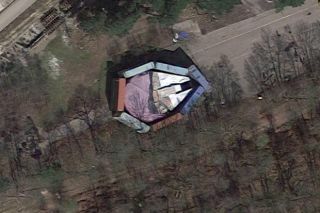 Han Solo's iconic "Millennium Falcon" can be seen hidden behind shipping containers on this view from Google Maps of Longcross Film Studios. The Millennium Falcon may have made the Kessel Run in less than 12 parsecs, but apparently its stealth mode leaves something to be desired. Han Solo's famous "Star Wars" spaceship is hidden in plain sight — at least for viewers browsing the satellite views provided by Google Maps. The Falcon's landing zone is surrounded by shipping containers on the edge of Longcross Film Studios in Chertsey, Surrey, according to The Sun. The English studio has been involved in films including "World War Z," "Thor 2," "Skyfall" and "Fast & Furious 6," its website reads. The Falcon seems to have first been spotted back in June by eagle-eyed Pete Hibbert, according to Jedi News. At the time of publication, the Millennium Falcon is rated 4.6 stars. Han Solo's famous flier is partially covered by a tarp, but is clearly recognizable, and looks ready to fly right into "Star Wars: The Last Jedi," which comes out in theaters Dec. 15. A recent trailer for the film shows a reunion between Luke Skywalker and the Falcon — both much older than their last encounter in the first "Star Wars" trilogy. An upcoming movie spotlighting Han Solo's origins is scheduled for May 25, 2018.